I was surprised at how park like the Rock Islands were. 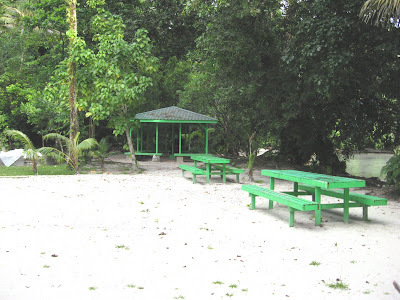 Except for the places close to Koror (Lee Marvin Beach and Ancient Village) all the beaches that tourists are allowed on have substantial shelters as well as real toilets (with ample toilet paper). They are well maintained by the rangers. Almost all of the photos that I've seen have been scenic shots with the camera avoiding the shelters. I was very curious as to what they looked like so here are some shelter photos. As you will note, they are built to accommodate large groups of people. 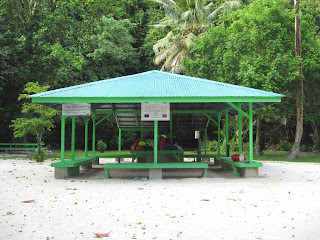 Cooking area at Ngemelis, I camped but did not kayak there.